Travelers from all over the world flock to Townsville, North Queensland to get a taste of the natural wonders the coastal city offers. Imagine living in any of the Lendlease communities in Townsville – the lush rainforest, tall gum trees, and rocky climbs are your constant setting. So if you happen to drop by Queensland on your Australia trip, make sure you check out these walks and hikes in Townsville. Drive 51 kilometres to south-west of Ingham to find the Niagara Falls of Queensland, the Wallaman Falls. Its waters cascade 268-metres down to a large pool and is known to be highest single drop waterfall in Queensland. You may choose to take a stroll down the 800 metre walk on the banks of Stony Creek or a 3.2 hike into the gorge. For those who are fit and ready, you can take the Wallaman Falls section of the Wet Tropics Great Walk, which is 56.5 kilometres. Magnetic Island is located 8 kilometres off the shores of Townsville and has essentially become a suburb over the years. But people go to the trouble of riding the ferry to visit the mountainous island for the Forts Walk. The four-kilometre walk starts at Radical Bay on Horseshoe Bay Road. You will find countless koalas along the main walk with breathtaking views of the coast of the Coral Sea. Magnetic Island also has a fascinating WWII history, showcasing command posts, gun emplacements, and more. Paluma looks like it was lifted off of the fantasy books written by J.R.R. Tolkien.It is known as the ‘village in the clouds,’ and true enough, clouds of fog and mist swim through its rainforest. Paluma is part of the Wet Tropics World Heritage Area and offers visitors trails for all levels, from 300 metres to 4 kilometres. The Paluma Range National Park also has an additional five Queensland Parks and Wildlife Service walks which includes signposts talking its history and a diverse faune. Make sure you make your way up Cloudy Creek where you will be treated to views of Halifax Bay and Palm Islands. No, this isn’t an Ed Sheeran song. Castle Hill may fallen a few metres short of being classified a mountain, but it offers a spectacular 360-degree view of Townsville. This is also a favourite site of fitness buffs running up its 286-metre hill. You might even see a rugby league player or two making runs on Castle Hill, too. For a dramatic picnic setting, make sure you get to watch the sunset on its vista — there’s nothing quite like it. A walk in Hinchinbrook Island will make you feel like you’re in Jurassic Park — except there are no dinosaurs ready to mangle you and you will actually have a pretty good time. This is Queensland’s largest national park and attracts hikers ready to take on the 32-kilometre Thorsborne Trail climb. Hinchinbrook Island separated from the mainland more than 100,000 years ago, and with the help of Queensland Parks who limit the visitors to 40 at a time, it has remained untouched. The overall environment changes dramatically on the island, so watch for when rainforests make way for granite mountains and mangroves turn into beaches. 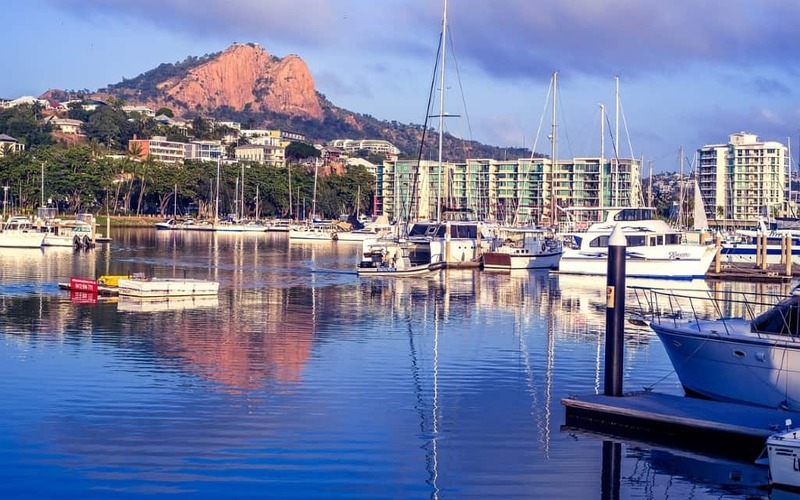 Townsville is home to a lot of natural wonders, and if you find yourself within the coastal city, make sure you visit these key destinations and get in touch with Queensland’s diverse flora and fauna.